lemon scent is enough to brighten any day which is why lemon verbena is wonderful in potpourri or just as a bowl of dried leaves to crumble and smell when the mood hits. Tip: Dried Lemon Verbena leaves can be ground and mixed with the sugar when making sugar cookies to give a slight lemony flavor. Lemon sugar can also be used to sweeten tea. In a 2-quart saucepan, heat sugar and 2 cups of water over high heat until sugar dissolves and mixture boils, stirring occasionally. Cover and boil 3 minutes. Add lemon verbena leaves. Cover and boil 2 more minutes. Remove from heat and let stand, covered 10 minutes to allow flavor to develop. Pour mixture through strainer. Cover and refrigerate up to one month. Stir into iced tea, seltzer water or fruit salad. Squeeze lemon juice into a small pot. Add lemon remains, lemon verbena leaves, 2 cups of sugar, and approximately 4 cups of water. Bring to boil and let boil for 4 minutes. Strain mixture into 1-2 gallon container and fill with water. Add more sugar to taste. Combine flour, oats, baking powder, baking soda, salt, and brown sugar. Cut in the butter until the mixture resembles coarse crumbs. Add the lemon verbena leaves; mix until just combined. Make a well in the center of flour mixture. Add the egg, yogurt, and milk and mix to form a soft dough. Pat the dough into a 12-inch circle on a baking sheet, and cut into wedges. Bake at 425º F for 15 minutes, or until lightly browned. Serve warm. Makes 8 servings. Grind the sugar and lemon verbena leaves in a food processor, until very fine. Blend with the flour and baking powder. Cut in the butter and set aside. In another bowl mix the milk, eggs and vanilla . Fold the flour mixture into the liquids. Do not over mix. 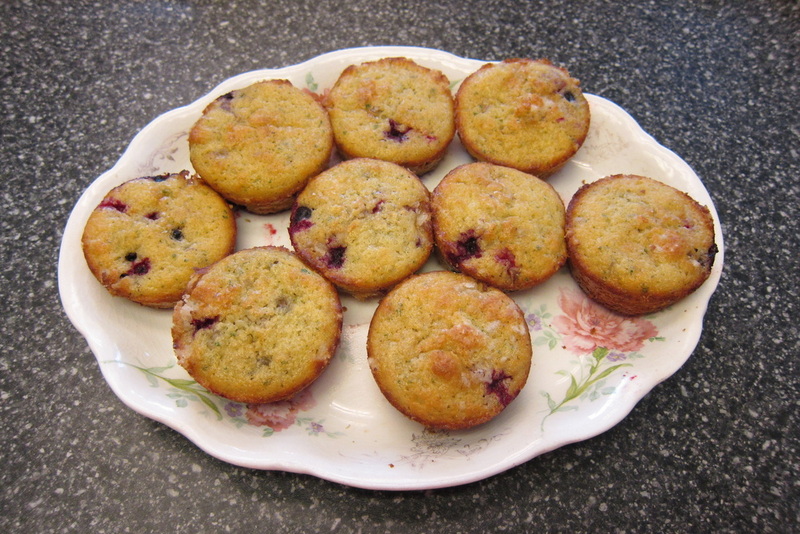 Fold in the blueberries and pour into muffin pan. Just for fun I tried this with Haskap berries (aka honey berries or edible honeysuckle berries) because they were ready a month before the blueberries. 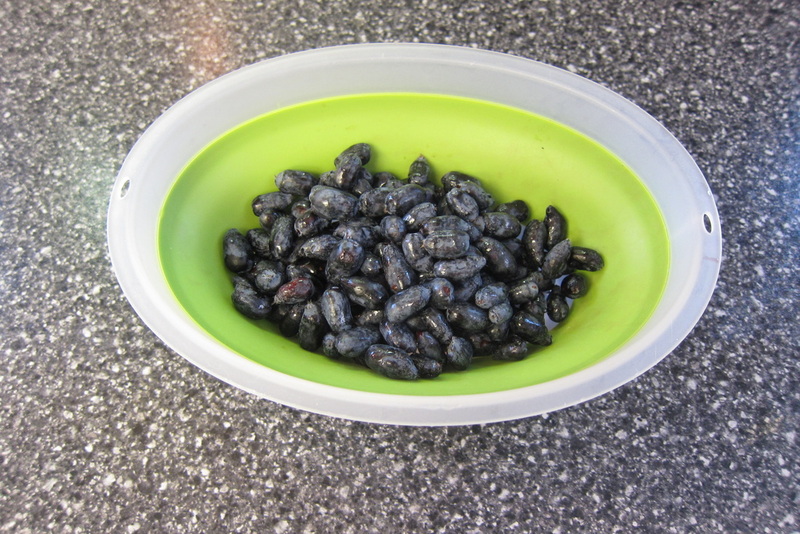 Haskaps look like elongated blueberries and are similar in taste except they are more tart. 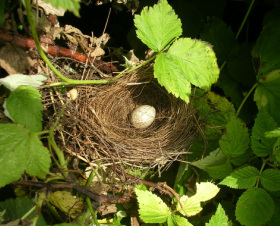 Joel's assessment on the honey berries : "they make lovely muffins." Combine milk and 10 lemon verbena leaves and stems in a small saucepan. Heat on low just until milk is hot (do not boil). Set aside to cool to room temperature. Pour mixture through a wire-mesh strainer into a glass measuring cup, discarding lemon verbena. Add additional milk to measuring cup to equal ½ cup, if needed, and set aside. 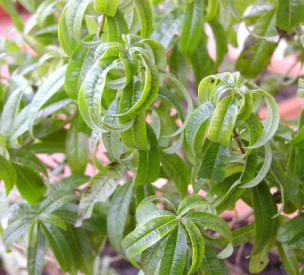 Process sugar with 20-30 lemon verbena leaves until they are very fine. Beat butter at medium speed with an electric mixer until creamy. Gradually add sugar verbena blend, beating until light and fluffy. Add eggs, 1 at a time, beating just until blended after each addition. Stir together flour, baking powder and salt; add to butter mixture alternately with reserved milk, beating at low speed just until blended, beginning and ending with flour mixture. Stir in lemon rind. Spoon batter into greased and floured 8-x 4-inch loaf pan. Bake at 350˚ F for 1 hour or until a wooden pick inserted in center of bread comes out clean. Let cook in pan 10 minutes. Remove bread from pan, and cool completely on a wire rack. Combine chopped verbena leaves and lemon juice in a small bowl. Cover and set aside. After bread has cooled completely, pour herb-lemon juice mixture through a wire-mesh strainer into a small bowl, discarding lemon verbena. Add powdered sugar and stir with a small whisk until smooth, adding additional lemon juice, ½ teaspoon at a time, if needed, until desired consistency. Spoon glaze over top of bread, letting excess drip down sides. Garnish with lemon verbena leaves. 2-3 weeks, shaking occasionally. Use to scent a room, or for sachets. Pour the boiling water over the lemon verbena leaves. Steep for about an hour. Strain the mixture, discarding herb. Use as a rinse after shampoo and conditioning your hair.